Habitat: Deciduous, coniferous, and mixed forests; wooded swamps, orchards, parks. Requires large trees for nesting. Diet: Wood-boring beetles and their larvae, caterpillars, ants, and some other insects; nuts, seeds, tree sap, wild fruits and berries. 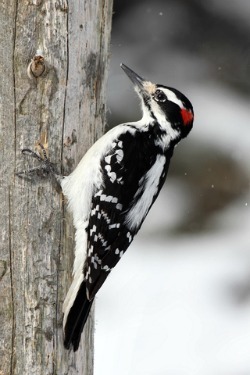 Like many woodpeckers, the hairy woodpecker prefers suet, but will also eat black oil sunflower seeds, hulled sunflower seeds, peanut hearts, and chunky peanut butter. Suet should be offered in a suet cage. A platform feeder is ideal for the other seeds and peanut hearts. 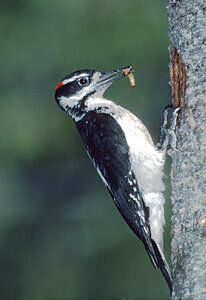 Peanut butter can be spread on pine cones or suet logs and hung near the feeder.